NEWPORT, Wales -- Amid talk of a possible cease-fire between Ukrainian forces and Moscow-backed separatists, President Obama and European leaders at a NATO summit meeting here on Thursday prepared a new round of sanctions against Russian officials, banks and enterprises that could be imposed as early as Friday. The action, intended to intensify pressure on Russia to cease its intervention in Ukraine, came as the Ukrainian president, Petro O. Poroshenko, said he would seek Friday to establish “a bilateral cease-fire” that would lay the foundation for a “stage-by-stage peace plan” for his country. Mr. Poroshenko also met with NATO leaders to discuss a new aid package the alliance will send Kiev. In a meeting here Thursday, Mr. Obama and the leaders of Britain, France, Germany and Italy “agreed that there need to be additional costs imposed on Russia for what they’ve done in Ukraine,” said Benjamin J. Rhodes, the White House deputy national security adviser. He said the United States would coordinate with the Europeans in imposing new sanctions to give them the “maximum impact” against Russia. “The key point is that Russia must continue to face costs for its own escalation,” Mr. Rhodes said. The extended European package, which was agreed to in principle by leaders at a European Union summit meeting last weekend, would cover state energy and defense companies, but would not include Gazprom, the giant Russian natural gas company, said one British official who requested anonymity under government rules. Restrictions on Russian banks would be extended, and there would be more measures against so-called dual-use equipment, particularly in the communications and aerospace sectors. The access of Russian banks to the European debt market would be further restricted and limited to shorter-term debt. Mr. Poroshenko said any cease-fire would be conditional on a planned meeting in Minsk, Belarus, on Friday of envoys from Ukraine, Russia and the Organization for Security and Cooperation in Europe. Other cease-fire efforts have foundered, and President Vladimir V. Putin of Russia, who spoke on Wednesday with Mr. Poroshenko about the terms of a potential de-escalation, has maintained that Russia cannot enforce an agreement because it is “not a party” to the conflict. Putin has repeated that claim lately in the face of accusations from Mr. Obama and NATO leaders that regular Russian troops are fighting in support of the separatists in Ukraine. Other rebels around Donetsk said that they would keep fighting as long as Ukrainian troops remained. The German foreign minister, Frank-Walter Steinmeier, said that he was moderately optimistic that the crisis in Ukraine was heading toward a resolution. But the Lithuanian foreign minister, Linas Linkevicius, was more skeptical. “It’s very difficult to talk of cease-fire issues when the Russians deny essential facts, like their involvement in the conflict,” he said. Despite the talk of a cease-fire, NATO’s language remained tough. “We call on Russia to end its illegal and self-declared annexation of Crimea,” said the secretary general of NATO, Anders Fogh Rasmussen. As part of a new aid package, NATO agreed to send about $20 million to Kiev to help with cyberdefense, training for its military forces and rehabilitation of wounded soldiers. The discussions focused on “nonlethal” aid, Mr. Rhodes said, despite rising calls for the United States and its allies to send arms to Ukraine. In Kiev, Senator John McCain, Republican of Arizona, said he hoped NATO would provide Ukraine with various defensive weapons it now lacks, including anti-tank weapons and intelligence, and press more stringent sanctions against Russia. “Because we did not support Ukraine, Vladimir Putin has become emboldened,” he said at a news conference, calling recent Russian backing for the separatists an outright invasion. In Moscow, the Russian foreign minister, Sergey V. Lavrov, complained that NATO’s language was making a settlement more difficult. “The burst of anti-Russian rhetoric, which we are witnessing exactly at the moment when most active efforts to find a political settlement are visible, means that the ‘Party of War’ based in Kiev has active, outside support, in this case, from the side of the U.S.A.,” Mr. Lavrov said, apparently referring to Mr. Poroshenko’s government. The summit meeting is taking place at a moment of rising challenges to NATO practically across the globe, a point Britain’s prime minister, David Cameron, the host, made in his opening remarks on Thursday. The two leaders met in advance of the summit meeting and committed to working together against the militant group, and discussed “the range of ways in which different countries can contribute” to confronting ISIS, Mr. Rhodes said. While Mr. Obama is not seeking a concrete NATO commitment to participate in a coalition against ISIS, Mr. Rhodes added, “We will be exploring with individual members what contributions they can make to a broad effort to degrade and ultimately defeat” the group. But the summit meeting’s central issue is how to deal with Russia and its challenge to the post-Cold War European order. Through some substantive and some symbolic measures, the alliance wants to calm members like the Baltic states and Poland that have been rattled by Russia’s aggression, and also make it clear to Moscow that the principle of collective defense remains sacrosanct and is credible. The principal measure NATO is expected to endorse Friday is the establishment of an upgraded rapid reaction force of some 4,000 troops able to deploy to pre-positioned bases and equipment in the east within 48 hours. 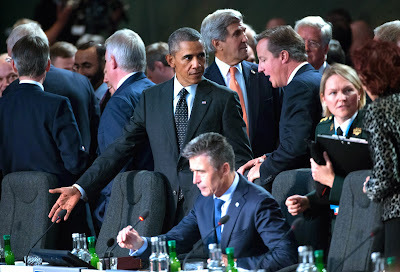 Without using the word “permanent,” which would violate an agreement with Moscow, Mr. Obama and Mr. Cameron called for keeping a “persistent” NATO defensive presence in Eastern Europe to make clear to Russia that the alliance is serious about the defense of all of its members.